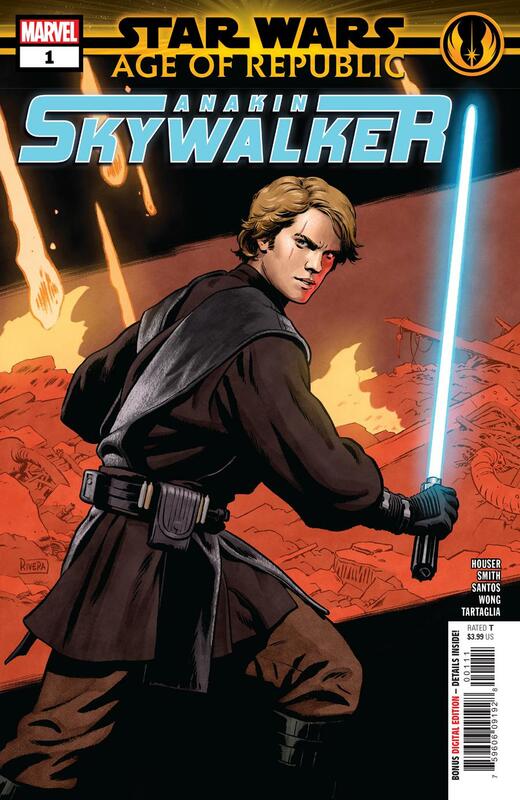 Star Wars: Age of Republic - Anakin Skywalker #1 is another fantastic one-shot following the young Jedi Knight as he struggles with the inhumanity of war. There have been a few departures but — for the most part — the core of the Age of Republic series has been heroes and villains questioning their places or roles in the Clone Wars. Anakin is perhaps the most obvious option for this kind of story, which could be a blessing or a curse. It’s interesting and intriguing to see the stoic monk Obi-Wan weigh his allegiances but in order to truly sell yet another story about Anakin’s inner conflict… it has to be good. Luckily, Anakin Skywalker #1 is. It provides a very good stepping stone in Anakin’s path to Vader. (Maybe too good, in fact — the events in this comic would go a long way in rapidly developing Anakin’s mistrust of the Republic.) It feels like the first issue in the Age of Republic that has really made use of its character’s misgivings — the “blessing” half, I suppose, of using Skywalker as the protagonist. The artwork in this series was worth the price of admission even when the stories didn’t hold up. Now it’s just a beautiful bonus. This issue is lighter on the action than… perhaps any of the other issues, and it seems the dramatic multi-page action sequences may have made their exit. Without those moments the artwork is no longer center-stage, but its quality has not faltered. Continuing the trend of Jango #1’s brisk and efficient pacing, this issue allows plenty of breathing room for the character to think and for the writer to deliver a well-rounded, complete tale. For the first few issues, Age of Republic was a beautiful but shallow series with wordy scripts that only got in the way. It has quickly become a series with thoughtful Star Wars stories and lore-building dialogue that rivals the (still outstanding) artwork.